The Karen National Union and the government have agreed to work together to try to solve contentious land issues, including confiscation. At the regional level meeting between the Karen National Union (KNU) and the Tanintharyi government, both sides agreed that the KNU and government would discuss and cooperate on land issues. The meeting between the KNU Mergui-Tavoy District leaders and Tanintharyi government ministers held in Dawei Town on November 8, the government reached agreement with the KNU on the recognition of Karen villages customary land rights, the recognition of the the KNU land measurement of Karen villagers’ land and for the KNU to establish reservoirs of forest land and wildlife sanctuaries. The KNU Mergui-Tavoy District chairman, P’doh Saw Beeler spoke Karen News. 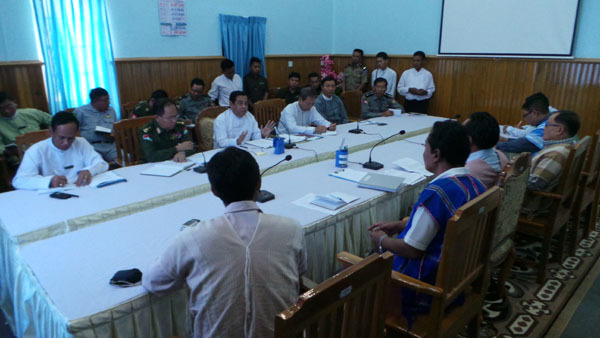 The KNU and the Tanintharyi government discussed ways to resolve land disputes, especially Karen villagers land confiscated for agriculture projects. P’doh Saw Beeler confirmed to Karen News that land disputes in the Mergui-Tavoy District are widespread and KNU receives many complaints from villagers on the issue.